Today I had a chance to talk to one of the fastest kickers in American martial arts movies, you could see him alongside famous martial artists such as Cynthia Rothrock, Jeff Wincott, Matthias Hues, James Lew, Karen Sheperd and others. 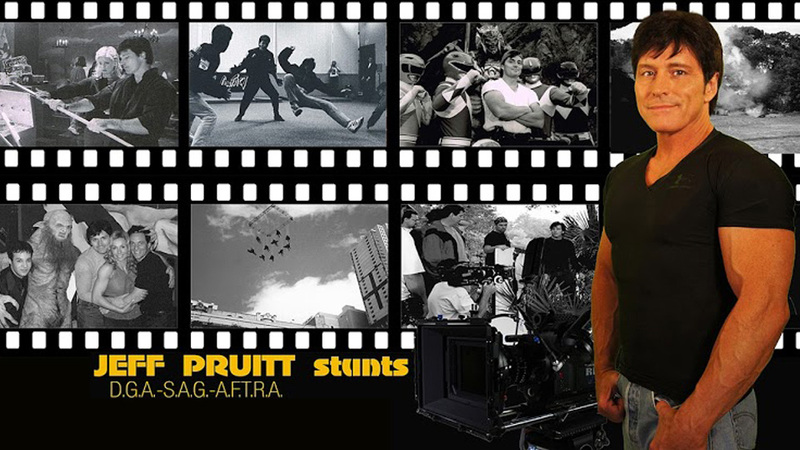 Jeff Pruitt mostly known for his hard stunt work and fighting choreography on TV Shows such as Buffy and Power Rangers, but he could play a lead in Bloodsport and American version of Jackie Chan‘s Police Story. Budomate: Jeff, please tell when you started your martial arts way and what inspired you? Jeff: When I was just a toddler I became fascinated by the martial arts I was seeing in spy movies; then came The Green Hornet series. That changed everything. From that moment on I was obsessed, but I had to learn from Mas Oyama books (as they didn’t have children’s classes anywhere near me in those days – too deadly they said). Then at age thirteen the Kung Fu movie craze and later the tv show became a fad and I got to start training at a school at last. Budomate: I know that you are a black belt in Tang Soo Do, why this martial art, does it connected somehow with Chuck Norris or Cynthia Rothrock, who are black belts too? Jeff: One of my original instructors was police officer and heavyweight champion, Lawrence Huff. He was connected to the Chuck Norris Tang Soo Do system. However, I trained with various Tae Kwon Do, Kempo, Boxing, and Muay Thai people through the years. Budomate: You started your career in Martial Law movie, in 1990, along side Cynthia Rothrock and David Carradine, how did you get a role of Johnson? What did you feel as a new guy on the sets? Jeff: I actually started years before and did a bunch of low budget films as well as worked as a camera operator, grip and production assistant. When I came to Hollywood I saw a guy I had worked with previously (and had given me good advice) was now directing a film called MARTIAL LAW. I sent in my resume’ but he never got it. Yet it turned out that he was calling my grandmother back in Georgia looking for me. He wanted me to choreograph fights for him. I told him I was too new in town and the other stunt people wouldn’t like it so he made me the assistant to the stunt coordinator. Then I wound up choreographing fights for MARTIAL LAW anyway – along with Benny ‘the Jet’ Urquidez and Pete Antico. I was nervous about fighting with Cynthia as I didn’t want to mess up and let her down. Steve Cohen, the director, told me to play Johnson and choreograph a fight for us that would allow me to show off a few kicks before she knocks me out, so I did. Cynthia was a real sweetheart to me. Budomate: Two years later you worked as a fighting coordinator on the Martial Law 2, was it easy to adapt your martial arts skills to Hollywood-Fu? Which part of this movie you like most? Jeff: I had been studying and adapting martial arts for film for many years prior, so it was only a matter of being allowed to do the things I knew would work on film. In those days a lot of the American film makers didn’t understand martial arts action and the tricks of Hong Kong cinema. It was a step by step process to get something new on screen each time I worked. I guess my favorite part of that movie was getting to fight with the star, Jeff Wincott. We always had fun on set. I even doubled another actor so he could do a full contact kick to my head. We tried to make the best out of every moment we had together. Budomate: You worked alongside Jeff Wincott who is a very talented athlete and martial artist. Did you know him before and how was it to work with such a great bunch of talents like Cynthia, Jeff, Matthias, James Lew, Karen Sheperd? Jeff: I met Jeff during pre-production of the movie and had him come over to my house to practice. I had seen him in a television show he starred in. We had a great time. He was always cracking us up and making faces at us between takes. James Lew, Cynthia and Karen Sheperd I knew from the martial arts world. Since they all have special skills it’s so much easier to make fights with them than your average actor. We can speak in shorthand and get a lot done faster. Matthias was a huge man with a big heart. He’s super strong, but super kind at the same time. It’s funny for me to see him playing the evil villain since he’s so sweet in real life. He gets a kick out of it though. Budomate: Mission of Justice is one of my favorite martial arts movies, I remember when I saw you speed technique and said “WOW, this guy is really fast!”. You worked as a stunt double for Jeff Wincott and as a stunt coordinator on this movie. Was it hard to fit a such big guy as Matthias into fights? Jeff: Thanks. Matthias was a big bodybuilder, that’s true, but he was also a graceful dancer. He understood movement and how to act in between the moves. He was also very tough. I would put my hand in a boot and whack him upside the head for an insert shot of Wincott kicking him. It was just another day at the office for him. You can’t do that with all actors. Budomate: What is your favorite fight in Mission of Justice and what would you change if you will have a chance? Jeff: I have two favorites; the “chop shop fight” with me and Wincott and the “gauntlet” stick fight. During the chop shop fight I decided to cut a bunch of things that my partner Koichi Sakamoto and I wanted to do together (he was stunt double for the Asian with a ponytail). The producers got scared that I might be taking too much attention away from our hero, so we didn’t show off what we could have done. Now I wish we had just done it. It would have only been some more good action for the film. Budomate: You have worked with Kurt Anderson on different movies, where did you meet him and was it hard to find a common language and vision? Jeff: I met him on MARTIAL LAW. We got along great and he is one of my favorite producers. He would watch Hong Kong films with me and he felt I was onto something by mixing the eastern and western styles. We saw things eye to eye, but were often overruled by the executives. He planned a movie for me to star in that would have been the first American martial arts film to showcase Police Story type comedy and stunts, but every time we started we’d get called to work on another project. Eventually I started directing on Power Rangers and we dropped the idea. Budomate: In 1996 you worked on Sword of Honor, please tell more about Tsuyoshi Abe and movie, any interesting moments on sets? Jeff: SWORD OF HONOR was shot in Las Vegas in 1994. Tsuyoshi was my roommate (along with Koichi) and I put them in every film I did. My favorite moment was when I got to touch Sophia Crawford for the first time. I had watched her in Hong Kong films and now here she was on set with me. So I would demonstrate for the guys how to grab her and things. Then Koichi and I would go off to the side and giggle over it. I had a crush on her but I was too shy to say anything. Budomate: You worked a lot with PM Entertainment as probably a lot of martial artists in 90s did, why do you think they are not active any more after 150 films and how was it to work with Pepin and Merhi? Jeff: When the direct-to-video market began to dry up they, and nearly all of the independent American action film makers, had to sell off their libraries to the studios and stop making films. Pepin was a cinematographer and involved in the on-set work while Merhi was busy handling the deal-making business. I enjoyed working for them. For a long time they kept many people working non-stop. They made the late 80’s and early 90’s a good time for the stunt people. Budomate: In 1993 you worked with Angelina Jolie in Cyborg 2 when she wasn’t a super star, how was it, any interesting memories? Jeff: I met a skinny little girl named “Angie.” She was sweet and had a pretty face and they told me she was the daughter of Jon Voight. She was a terrific actress. Only later when I saw her in the GIA biopic did I understand what a huge star she could be. I doubled the lead and choreographed a couple of fights I was in, but the memory that sticks out in my mind was the night a stuntman had told the director he could double Karen Sheperd himself and leap from one rooftop to another using a full size trampoline. The stunt coordinators wanted to use wires, but then they allowed him to set up the stunt for himself and stayed out of it. When the time came he realized during rehearsal that he wasn’t getting enough distance to make it to the rooftop on the other side of the alley. He was about five stories up and had no air bag below for safety. I was visiting the set that night and I thought, “This guy may kill himself.” So I tied myself to the opposite rooftop using webbing and bungee so that if he missed I could attempt to leap out and grab him. It took hours for him to get up the nerve to actually jump. He would start, then yell cut and stop. Finally he went for it, sprang from the tramp and through the air across the alley towards the other building. I grabbed his legs as he hit the edge of the pad on the rooftop. He came within inches of falling to his death. I just looked at him and said, “Don’t ever pretend to be able to do something you can’t again.” You can bluff your way through the acting world, but in the world of stunts that kind of behavior will get people killed. Later on I was able to get him to train up for a big high fall on one of my movies – 100 feet. I knew if he trained step by step he could do it and redeem himself for some of his earlier mistakes. And he did just that. It was a beautiful stunt. Budomate: I suppose TV Series is another side of you career, you worked on tv shows such as Power Rangers, Robin Hood, Buffy, which one is your favorite and which one was the most difficult for you? Jeff: Favorite is BUFFY because I enjoyed the writing of the show and because Sophia and I worked on it alone except for the stunt people I would hire each week. POWER RANGERS was fun too, but it was a show for toddlers so I didn’t care about actually watching it myself. SHEENA was a blast because I got to work for Steve Sears and Doug Swartz, two supportive and hard-working producers. ROBIN HOOD was the worst. It was supposed to be campy so we’d shoot all these stunts and fights that needed to be edited in a Hong Kong style. Unfortunately, unlike POWER RANGERS where I got to sit in with the editors, on ROBIN HOOD the footage was sent to France to be edited by some film students who felt action scenes were beneath them. They didn’t understand what to do so they would grab close ups of people (sometimes from another episode) and cut away from the fights. I got so disgusted with the way it was run that Sophia, Canadian stuntman Jason Cavalier, and I made the decision to quit and walk away from it. I actually liked the producer, Fred Weintraub, but he was never there. There was a terrible producer left in charge of running the show and he ran it right into the ground. The lead actor, Matthew Porretta, didn’t want the main unit directors attempting to shoot fights without us and he wanted to leave too, but he was under contract to finish out the season. He did that and then quit. I had a great time with my action unit and the stunt people, but the show was ruined by too many others attempting to undermine each other. It was a bad environment to be in. Fortunately I went directly into making BUFFY THE VAMPIRE SLAYER as soon as I got back to the states. Budomate: What martial arts style is more adaptable to a movie fight on you meaning? Jeff: I think having Korean style kicks and boxing hands helps. It’s more in-between the hits that ‘body acting’ that makes all the difference. Many times I’ve worked with a champion boxer or MMA fighter and found them to look boring when trying to perform for film fights. That’s because they learn in real fighting to hide everything, never to telegraph, use short movements, and never leave yourself open. Well… in film those are the things that read on camera. You can throw a perfect tight hook punch that would knock someone out but in a movie fight it looks like nothing. However, if you can throw a wide arcing hook that leaves your facial expression open for all to see, and if the stuntman does a perfect reaction, it looks like you are tearing the guy’s head off. Movie fighting (regardless of the style) is a separate skill from street or ring fighting and has to be learned. It’s really body acting. Budomate: You never worked in Asia with Asian action stars, why? Who is your favorite actor which you want to work with? Jeff: Around ’82 or’83 I was asked to go to Hong Kong for a film. It would have been my first movie. I flew to New York to meet with the producers, but nothing came of it. So I concentrated on doing every low budget project I could to get real hands-on film making experience. A second unit director I was working with got the job of directing a movie called Bloodsport around 1984. He considered me to play the lead character. Then one night I shattered my ankle on set and I was out for a year. He went on to use a guy called Van Damme in the part. So once again I missed out on going to Hong Kong. By the time I was finally able to go there on my own I didn’t want to. There I would have been just another foreign devil to beat on. In Hollywood I got to be the one bringing a new style to the action flicks. That was a better deal for me at the time. As far as a favorite Asian actor to work with? There are so many. I like Tony Jaa and the guys who come from a stunt background like Jackie and Sammo. Yet I also love Chow Yun Fat for his brilliant acting. However, my personal favorite to watch is Stephen Chow. He is a genius. Though I’ll admit I would get into a time machine in a second if I could go back and work with Bruce Lee. I would take the kick to the chest in ENTER THE DRAGON and never wash the footprint from my gi – just out of sheer appreciation of what he was doing. Budomate: In 2009 you worked on Black Dymanite alongside Michael Jai White, who is probably a hard guy to fit into the movie fight because of his muscles and fighting skills. What do you think about his career and movie? Jeff: That guy is great because he’s such a skilled actor and yet a fantastic martial artist too. It’s hard to get both skills (at that level) in one person. I loved him in BLACK DYNAMITE and portraying Mike Tyson. He’s really, really good. Budomate: I sure you heard about Boyka phenomenon and Undisputed movies, do you like them and do you want to be a part of Undisputed 4? Who do you think Boyka has to fight this time? Jeff: My buddy Issac Florentine directs those. He started POWER RANGERS and then turned it over to me so he could pursue his directing goals. He’s really brought the quality of action in low budget films up. Issac has some of my stunt buddies doing his movies overseas now. He wouldn’t need me. But who would I like to see Boyka fight in the next one? I have to go with either William Shatner or Buffy the Vampire Slayer – but I’m pretty weird. Budomate: How did it happen that you became a part of Britney Spears Live: The Femme Fatale Tour TV movie? Jeff: My pal Scott Duthie was stunt coordinating the show. He knew Sophia doubled Britney and Madonna so he had us fly in for the project. It was a lot of fun for us all to get together again. Budomate: Your latest movie is Battle of the Damned with Dolph Lundgren, how was it to work with a Big Swede? Don’t you think zombie topic is a closed issue like vampires and gods? I got so tired of vampires after BUFFY that I couldn’t watch anything with vampires in it for a long time. And magical gods were usually boring to me. Zombies I like as long as the show is interesting. I prefer good sci-fi writing that gives an explanation for the unusual happenings in the story. Budomate: Do you have a favorite superhero who imspired you in childhood and who you want to play on the screen… maybe in Avengers 2? Jeff: I grew up in a small town similar to Smallville so I identify with Clark Kent and his morals more than any other character. Although I think we all have a little of lunatic Dark Knight in us that we have to keep under control. An Avenger character specifically? Well… I’d like to be Tony Stark because he has all the cool stuff and billions of dollars, but most likely I’d be Capt. America because I’m just that corny in real life. Jeff: We met at a screening for one of my movies. She had seen me in MISSION OF JUSTICE while in Hong Kong and wanted to meet me. After we worked together on SWORD OF HONOR I asked her to join the POWER RANGER stunt team as the Pink Ranger. About a year or so later we began dating. The only hard part about being married to someone from the United Stuntwoman’s Association is when they ask me to edit demo reels for them. Imagine 24 different women bringing you footage that is all in different frame rates and formats. It’s a mess alright. Budomate: Who is the next martial arts star on you opinion, who has it all? Jeff: There are some really talented people out there now who grew up studying all the things we did and they are really capable of doing any genre’. They’ve seen it all and can do it all. Of the “newer” guys, Scott Adkins comes to mind right away. He will gain or lose weight to portray his characters if need be and his acting is just excellent. If he could just get a big budget starring role it would be great. Think of a good Tom Cruise movie with him in the lead. I’d like to see something like that. Budomate: Why do you think a lot of modern blockbusters using shaking video cams for fights, what are they trying to hide? Jeff: I’ve seen fights shot well using hand-held only, but done smoothly. Yet often times I’ve seen a director who has no clue how to shoot martial arts action tell the camera operator to “make the lens breath” and jerk it around haphazardly to “add energy.” This is terrible for most fight scenarios. Choreography is like good screen writing. One thing flows to the next and the camera and editing carries you along with the story of the action. A bad producer will come in and rip some pages out of a script to save money, not realizing that the writer has a reason for each line that will pay off later. It changes a good script into another hacked up mess. This is often what happens to our fights as well and is why I feel so much for the screenwriters. Budomate: My traditional question: please name 3 martial arts movies which you can call a classic of a genre? Jeff: First of all, ENTER THE DRAGON, because it was the first real martial arts movie made specifically for a Western audience in which the characters spoke English throughout. And it was Bruce’s last film that would have launched him into Hollywood superstardom. POLICE STORY. One of my all time favorites because it brought martial arts, great stunts, and comedy to the modern police action film. ONCE UPON A TIME IN CHINA. It elevated the quality of kung fu films and got a lot of people interested in wire gags for fights that might not have been otherwise. All rights for Jeff Pruitt interview reserved by budomate.com and can not be used without official permission.